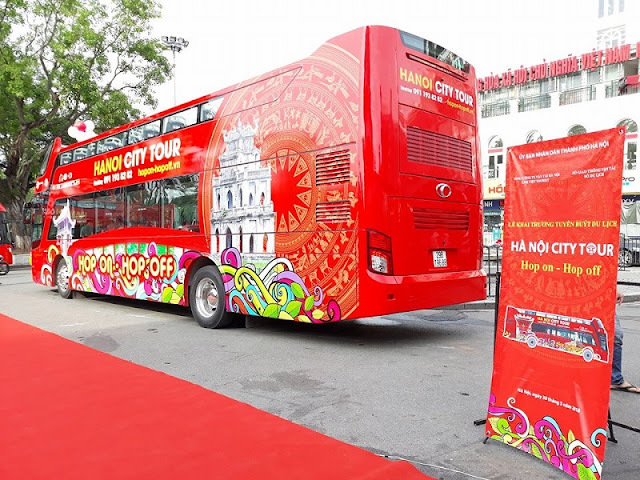 On May 30, Hanoi will welcome the Hanoi City Tour Hop on-Hop off with double-decker buses after two successful launches of similar means of tourism in Ho Chi Minh City in 2016 and Danang in July 2017. The tourist buses are developed by Hanoi Transport Corporation (Transeco) and Anh Viet Hop on-Hop off Vietnam Co., Ltd.
“Hanoi City Tour Hop on-Hop off is a flexible and convenient means of travel, offering a combination of travelling and sightseeing Hanoi’s attractions by double-decker buses,” said Transeco’s representative. An expert in the travel business said that with the flexible Hop on-Hop off city tours, arrivals could get in and get off at any stops and do not need to follow a pre-set route by a travel agency. The buses will arrive to the stops in every 30 minutes, which will make it easy to travel to new destinations. The representative added that route 01 of Hanoi City Tour Hop on-Hop off will cover 25 streets and 13 stops, allowing tourists to enjoy Hanoi’s 30 unique attractions. In addition, Hop on-Hop off city tour buses are also equipped with LCD panels that provide information on attractions in many different languages. Therefore, holiday goers could refer to these helpful guides to decide whether to stay on or get off at the sightseeing stations. The Hop on-Hop off city tour is a type of travel featuring buses cruising between the city’s popular attractions. This type of travel is quite common in the world’s larger cities, including London, New York, Vancouver, Singapore, and Kuala Lumpur. In July 2017, Empire Group, the developer of the Cocobay complex, entered in to a cooperation with THACO Group to launch Coco City Tour with 12 double-decker buses with the capital of VND72 billion ($3.17 million). Two years ago, Vietnam’s first Hop on-Hop off city tour with double-decker buses was launched in Ho Chi Minh City. These buses were also developed by Anh Viet Hop on-Hop off Vietnam Co., Ltd.